The settlement of Lee County, Iowa occurred after the vast majority of Indians had moved westward. Few of the early residents encountered hostile Indians in their lifetimes. However, one native of the West Point / Donnellson area rode west to Montana and Idaho, and was caught up in the last great Indian war involving Chief Joseph and his Nez Perce tribe. Alexander Cruikshank, Jr., the son of Alexander and Keziah Perkins Cruikshank, was born September 12, 1849. His birthplace was a large plank cabin over four miles west of West Point and over two miles south of modern-day Pilot Grove. Chief Black Hawk had been a visitor to the Cruikshank residence before he died in 1838. When Alex was less than a year old, his father built a larger home next to the cabin using bricks he made on-site. It was there Alex was raised, along with several brothers and sisters. His oldest brother was the first child born in Lee County, except for children born at military posts along the Mississippi River. Little is known of Alex’s early life. 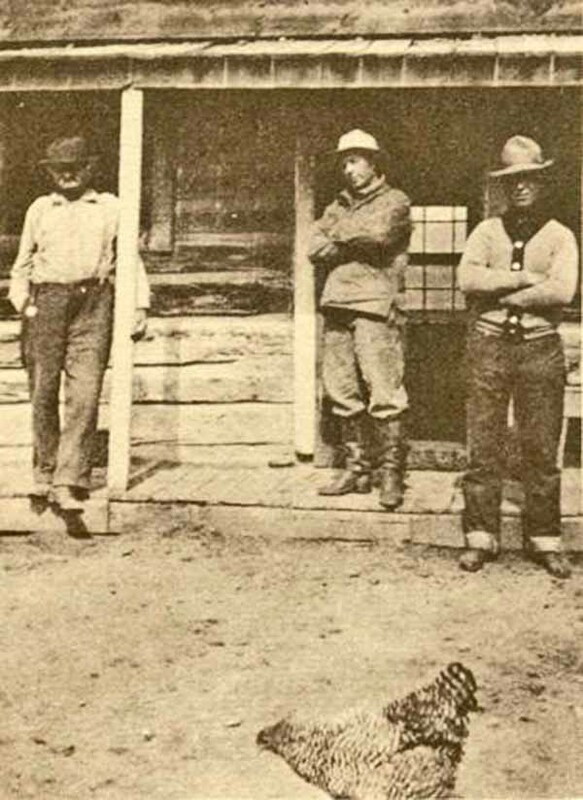 However, he had inherited a pioneering spirit from his father, who was one of the first settlers of Lee County. At a relatively young age, Alex moved to Texas, where he worked for several years as a cowboy. In 1872, Alex followed his sister, Kate (Mrs. Samuel Dunlap) to Bannack, in southwestern Montana Territory. Kate was one of the first public school teachers, if the not the first, in that state. Alex built a ranching operation south of Bannack, on Horse Prairie. The prairie was so named because it was there that explorers Lewis and Clark bought horses from Sacagawea’s bother. Alex was said to prefer the quiet life at his ranch. However, during 1877, a year after Custer’s last stand near Montana’s Little Big Horn River, his property fell into the path of the Nez Perce tribe that was alternately fleeing from and fighting the U.S. Cavalry. The army, under General O.O. Howard, was under orders to forcibly remove the Nez Perce to a reservation in Idaho. Chief Joseph led his band of 800 men, women, and children eastward across the Idaho panhandle into Montana. There they engaged the Army in the Battle of the Big Hole River. Retreating, they moved southward along the continental divide. After that encounter, the Indians killed another man at the Hamilton Ranch, and stole a band of horses at the Cruikshank Ranch. The cavalry, in close pursuit, stopped at Alex’s cabin. Because of his familiarity with the terrain, Alex was asked to serve as a scout for the soldiers as they searched for the raiding Indians. He and the other scouts were led by the veteran, Orlando “Rube” Robbins. During their pursuit of the Indians, Alex and his party were approached by two “Chinamen,” who said they had just escaped a shootout up ahead at Birch Creek. Their group of freighters, men who transported military and merchant supplies, had been captured by a large contingent of the Nez Perce. 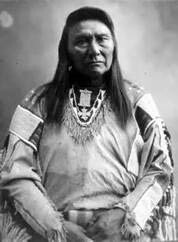 Chief Joseph himself was believed to have been present. The Chinamen said the Indians had consumed large amounts of whiskey from the freight wagons and then shot all the other freighters. The soldiers were asked to ride to the site and rescue any possible survivors. Colonel Shoop was concerned that a large force of Indians might still be there, and that his group was too small to be an effective fighting force. He started to turn his soldiers in the opposite direction. Alex, however, rode up close to the group and said, “If there is a man in this crowd that will go with me, I’ll go to the freighters tonight.” A couple of the men in the party spoke up. Then Chief Tendoy, a friendly Bannack Indian, said he and his 15 braves would also go. It was nearly sundown when they left Shoop’s party. Alex and his group rode along for about two miles at a time, and then the Bannacks dismounted to light their pipes and listen. In time, the group arrived at the mud flat that was the head of Birch Creek. They found a nice meadow where they rested before pushing on to the site of the massacre. With stealth, they traveled another ten miles and heard the sound of horses feeding and dogs barking. They were close to the reported site of the massacre. Stopping to listen, Chief Tendoy sent his son ahead to look for signs of any Nez Perce. Soon a band of horses, estimated by Alex at 1,000, ran past. Fearing a sizeable band of Nez Perce would follow, Alex and his group jumped on their horses and rode away as fast as they could for several minutes. However, when things quieted down, they returned to Birch Creek. By that time, the men had been riding for a long time without food. Alex said, “We were not looking for dead men. Grub was what we wanted.” They found the freighters’ camp fire and grabbed the remains of a scorched ham and some canned fruit. Then they fell back into the brush to eat. Dawn was approaching. A few of the Bannack Indians reconnoitered the vicinity, and found some horses and mules, including seven with Alex’s brand. 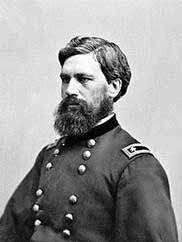 Shortly thereafter, Colonel Shoop made his appearance with a contingent of cavalry and some wagons. He said he would arrange for some Indians to take Alex’s horses back to his ranch if Alex would stay on as a guide. A man named Dave Woods then rode up and said he had found the men who were killed, about a quarter mile away. Alex threw down his horse shoeing outfit, and they hurried to the site. Chief Joseph lived out much of the rest of his life on the Colville Reservation in eastern Washington. He has been featured on at least two U.S. postage stamps. General Howard later became superintendent of the U.S. Military Academy at West Point. 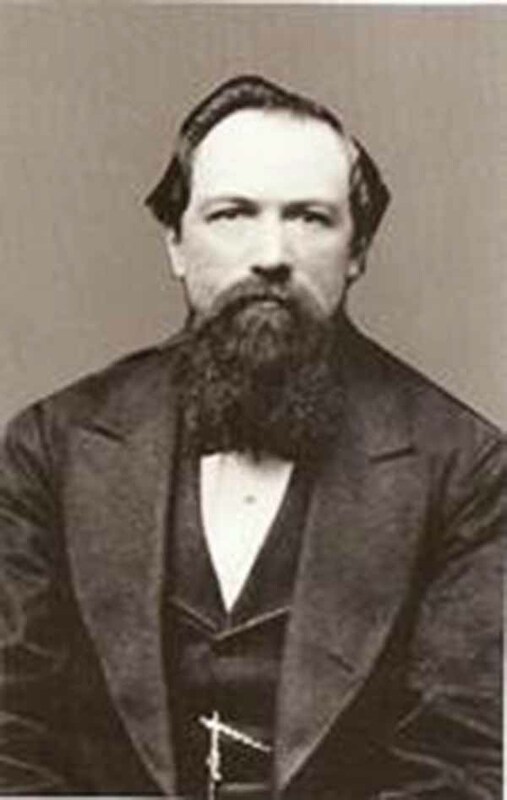 Rube Robbins spent 25 years as a deputy U.S. marshal and served variously as traveling guard, work foreman, and warden of the Idaho State Penitentiary. He also served terms in the Idaho legislature. After the capture of the Nez Perce, Alex went back to ranching. He followed his sister, Kate, once again when she moved westward across the Beaverhead Mountains into the eastern panhandle of Idaho. While Kate lived in the towns of Junction and Salmon, Alex found a ranch property at a higher elevation east of Leadore. He acquired considerable stock interests there. He was described as one of the few who actually “rode the range” and “bulldogged the doggies” and lived the life portrayed by TV westerns. During busy times, he and his hired men were said to subsist on sourdough, salt back, coffee, and cold soda biscuits. Cruikshank’s ranch was fondly referred to as “Cruikie’s” by the locals. As he was the first rancher in the vicinity, the valley leading to his ranch became known as Cruikshank’s Canyon. The creek that flows through it was called Cruikshank Creek. The canyon was later renamed Railroad Canyon, but the creek still bears his name today. Alex was a bachelor his entire life, and died on January 25, 1919. He was a pioneer of both Beaverhead County, Montana, and Lemhi County, Idaho. His obituary described an openhearted and generous man who gave lavishly of his own possessions to help his fellow man. His grave is in Salmon, Idaho.